Get quenched and chill out with this deep dip of cool hydration. Guac Star is a revitalizing facial packed with fresh avocado butter, extract and oil to deliver key fatty acids to support the outermost layer of skin that protect us from environmental stresses. Your parched skin is instantly soothed with an additional host of powerful antioxidants that neutralize free radicals to help prevent and repair UV sun damage. Botanical hyaluronic acid boosts moisture levels to minimize the appearance of fine lines and wrinkles. Vitamin E and Organic Jojoba Seed Oil offer some SPF protection against UVB rays. Organic Aloe softens and soothes skin.Avocado's smorgasbord of vitamins B5, B6, K, E, and C, copper, folate, and potassium, and its naturally moisturizing qualities completely comforts and nurtures skin. Advanced protection from UV damage. Helps brighten complexion + repair sun damage. MSM helps improve skins elasticity + firmness. Visibly improves appearance of fine line + wrinkles. Ferulic Acid extends protective effects of Vitamin C + Vitamin E.
Hyaluronic Acid boosts moisture levels to help plump skin. The perfect summer facial to keep your skin hydrated and protected! For you lovers of all natural skincare, this is your dream facial! Incorporating products from Farmhouse Fresh & Rutz Natural Skincare, two lines dedicated to providing an extraordinary treatment using natural botanical ingredients, this facial will soothe, rejuvenate and nourish the skin with incredible sensations and euphoric aromas. Patented peptides, natural ingredients and proven actives combine in this award-winning facial that balances natural and organic ingredients, with performance... making this facial both effective and an amazing sensory experience. Allure Magazine chose Farmhouse Fresh as Best Spa Facial Products and Rutz is a local grown, women owned Pittsburgh company that is making waves in the international skincare scene with their reiki infused, natural products. You are sure to leave as obsessed with these brands as we are! Includes cleaning, exfoliation, extractions where necessary, steam, facial massage, mask, and hydration. Incorporating the most cutting-edge science and natural, ground breaking ingredients, this facial will enhance your results and keep your skin glowing for weeks. Relax and enjoy as your skin undergoes a magical rejuvenation with: thorough cleansing with steam treatment, hot towels and ice therapy, stimulating mask and exfoliation applications, soothing massages, extractions of pore clogging build up and hydrating finishing treatment. This mini facial is ideal for those looking for a quick skin freshener. Your skin is cleansed, lightly exfoliated, gently massaged and followed by a veil of light moisturizer. Natural and organic Farmhouse Fresh skin care is 99.6% natural and naturally derived ingredients, and chock full of fruits, vegetables, milks, and more from U.S. farms and will leave your skin feeling nourished, radiant and healthy. The gentleman's facial uses natural organic products especially selected for a man's skin and individual needs. Using steamed towels receive a face, neck and hand massage with non-perfumed, non-greasy, natural products. This 50 minute facial is wonderfully relaxing and fantastic for keeping a man's skin in optimal condition. This facial helps to renew skin, improve blood flow, and is high in antioxidants and minerals. This slows down depletion of collagen and the sagging of skin caused by the elastin breaking down, stimulates the growth of new cells, and reduces the appearance of wrinkles and fine lines. Incorporating the most cutting-edge science and natural, ground breaking ingredients, this facial will enhance your results and keep your skin glowing for weeks. Relax and enjoy as your skin undergoes a magical rejuvenation with: thorough cleansing with steam treatment, hot towels and ice therapy, stimulating 24K Gold mask and exfoliation applications, soothing massages, extractions of pore clogging build up and hydrating finishing treatment. Also, for an added treat, we will end this luxurious facial with Crystal Gel Collagen Power Eye Mask. Great for puffiness and dark circles! Pamper yourself with a treatment fit for a Queen and watch your skin thank you for this loving attention. Dermaplaning uses a blade to gently exfoliate the outer layer of dead skin cells and remove fine facial hair commonly known as “peach fuzz”. It can be used as an alternative to chemical peels or microdermabrasion or along with these procedures for an enhanced result. Performed by a licensed and experienced esthetician, this procedure produces an immediately more radiant appearance. Following this treatment, makeup application is smoother and other skin products penetrate deeper making them more effective. People who are going through anti-cancer therapy experience new and different skin conditions. Most common side effects are fragile, itchy, dry skin, neuropathy, pain, anxiety and stress. Our Oncology-trained Esthetician is able to help alleviate and improve these skin conditions. The goal of this custom safe treatment is restore, hydrate and protect; helping the skin to heal and repair by supporting the natural functions of the skin. Prior free consultation is must to determine an appropriate treatment plan. Please call 412-441-0860 to schedule. TARGETED SKIN SOLUTIONS- For those COMMITTED TO transforMING their skin. A less intense version of the DMK facial, Evolve’s Signature Facial, provides you with an uplifting experience that will turn back time. Our botanical protein masque provides intense stimulation for facial muscles causing them to tighten and tone like a mini face lift. Results last up to two weeks. In addition, we will pamper you as our double enzyme exfoliation deeply cleanses and removes dull looking skin revealing a youthful glowing appearance. With the added luxury of a hand treatment, focused attention on the eye area, soothing massages, hot towel treatments and aroma therapy…this is sure to be your go to facial for that special event, hot date or night on the town! Are constants break outs driving you towards a break down? We can help! This healing treatment uses digestive enzymes, natural herbs and our custom mandelic complex to reduce bacteria, soften and dissolve cellular buildup, reduce inflammation and lighten pigmentation for clear, healthy-looking, radiant skin. Seeing red? Reduce inflammation and bring about a healthier look to the skin this naturally soothing facial. With antibacterial support and cellular rejuvenation, this corrective facial will strengthen capillaries and minimize fine lines for smoother, younger-looking skin and a balanced complexion. With the added benefits of specialty serums, hydrating masks, and a refreshing ice treatment – skin will have a radiant glow and refined appearance. Confused which facial is best for your skin or have several skincare concerns you would like to address? 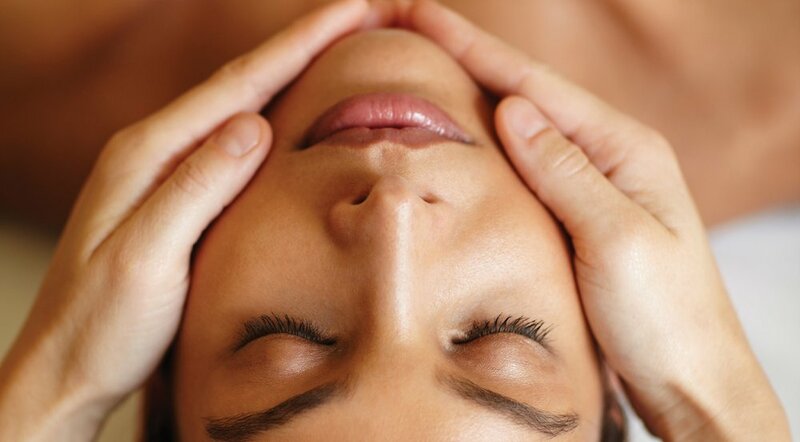 Our customized facial with Olga utilizes a variety of modalities and skincare cocktails to treat your specific needs! Using a combination of modern techniques liek Ultrasound High Frequency incorporated along with ancient healing technique like Gua Sha & face cupping Olga will deliver an amazing facial that will leave you feeling like a new person! Complimentary paraffin-alternative hand treatment is included.